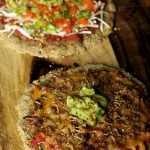 Tacos meet pizza in these two very different and yet very familiar recipes. It may involve several steps but it’s all well worth it! Whether you decide to purchase a flatbread or pizza bread or decide to make your own, be sure that you keep in mind the size of the bread. All ingredients in each group are measured out to fit a 5-inch small personal pizza. IF MAKING YOUR OWN DOUGH: Preheat oven to 350. If you’re using the pizza bread recipe above, instead of making one ball out of the dough, make two – one for each pizza. Flatten both so they’re about 1/4 of an inch and bake for 10 minutes. Cook pasta sauce, salsa, and adobo seasoning for about 5 minutes. VEGAN: Combine a pinch of adobo seasoning with bell peppers and garlic. Once the dough is cooked, top it! Get creative. But if you’re looking for instructions, start with the sauce, then shredded vegan cheese, then veggies. TACO PIZZA: Cook onions on a frying pan until translucent then add minced garlic. Combine spices with turkey meat and add to pan. Cook thoroughly. TACO PIZZA: Now it’s time to top your cooked dough. Again, start with the sauce, then add the Mexican shredded cheese and top with a bunch of turkey meat. Bake both pizzas for 15-20 minutes until cheese is golden brown (on Taco Pizza) and veggies are just a tad charred (Vegan Taco Pizza). Top pizzas with guacamole and call it a day!